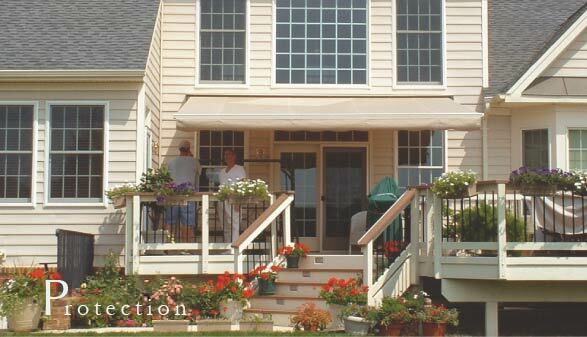 Recacril© fabrics are perfect for awnings and other outdoor applications. Recacril© has a tighter weave and provides outstanding water resistance and fabric stability and is Perfecta’s fabric of choice. The fabric weighs 9 oz per square yard and is made of 100% solution-dyed acrylic. These fabrics are made from 100% solution-dyed acrylic fiber, which gives unsurpassed color brightness. The fact that the fabric is woven allows the fabric to be translucent and breathe. Sunbrella & Dickson have a fluorocarbon finish, which provides excellent water repellency. Please click on the logo for more information. Tenara sewing thread brings the best of science and technology to your seams. Using scientific engineering expertise, Tenara has developed a unique sewing thread material that can stand up to the ravages of environmental exposure over time. Tenara sewing thread will not be damaged by exposure to sunlight, weather, or water. Protect yourself from a low setting sun with a retractable valance. Adapting to best suit your needs, this vertical extension of the fabric deflects glare and safeguards your privacy with the turn of a simple gear mechanism. Enjoy additional shade on the front of your awning or separately as a vertical porch shade. This is the portion of fabric that flows down on the front of your awning. This valance will be visible at all times even when the awning is retracted. Let us show you our fabulous selection of fabrics, patterns, valance designs, and binding colors available. Somfy is our motor company of choice. Using a Somfy motor allows you total ease of operating your awning. Somfy�s electric motors are fully contained within the roller tube of your awning, for a clean concealed installation. An override motor will provide you with movement of the awning even if a power loss occurs. The wall switch must then be placed in the neutral/middle position and the crank can be used to move the awning in and out. Somfy's advanced and patented radio technology (RTS) empowers you to simply operate your motorized awning by pressing a button on a remote control transmitter or wireless wall switch. By definition, RTS means no wiring between the motorized awning and the control, so installation is quick and easy. 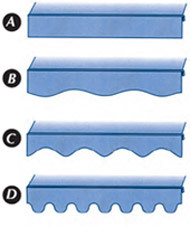 Somfy's torque motors allow an awning to self-adjust the closing mechanism which keeps your fabric cleaner. When the sun shines, a Somfy sun control allows your awning to extend by itself to provide elegant shade on your deck or patio when you need it . . . and when the weather turns cloudy, rainy, or windy your awning will automatically retract against the facade of your home allowing natural daylight to enter. The Eolis Wire Free RTS Wind Sensor is a wire free battery-powered wind sensor that provides automatic wind protection for retractable awnings. Designed with Radio Technology Somfy (RTS), upon detection of excessive vibration, the sensor emits a signal to retract the awning automatically. The Ondeis Wire Free RTS Rain & Sun Sensor is a wire free battery-powered rain and sun sensor that senses moisture from heavy fog to a downpour and brightness levels from .5 klux to 50 klux. Using this sensor can protect you from harmful UV rays and provide comfort and energy savings. This sensor can be used with the Eolis Wire Free motion sensor to maximize awning protection. The Outdoor RTS Lighting Receiver can remotely control an incandescent or halogen lamp or other devices up to 500W. This control will allow the user to control their patio or deck lights with the same control as their awning. The Outdoor RTS Lighting Receiver is packaged in a weatherproof enclosure and includes watertight strain-relief fittings for wires entering the box. The Outdoor RTS Lighting Receiver is compatible with the Telis RTS range of transmitters and the DecoFlex™ RTS wall switch. LED Light Kits include four (3') light strips that mount underneath of the arm of an awning and are controlled by a dimmable RTS control. They are available in bright white and warm white. if additional channels are needed. Somfy offers end product suppliers a 5-year warranty on all motors and controls. Specifically, Somfy warrants its motors to be free from defects in material and workmanship under normal and proper use for a period of 5 years commencing with the date stamped on each product. If the Somfy product fails within this 5-year period, Somfy will repair or replace it free of charge through your end product supplier. Labor to change the item is the responsibility of the product owner. Learn more about Somfy.